Seoul (dpa) - Fat people between the ages of 60 and 70 years are less intelligent than thin people, according to a new study published in the South Korean journal Age and Ageing. There was insufficient evidence to find a correlation with people older than 70, according to the study that found people with a lot of abdominal fat showed lower cognitive performance. The study noted that the fat tissue immediately under the skin - subcutaneous fat - had no such influence. "Our findings have important public health implications. 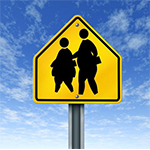 The prevention of obesity, particularly central obesity, might be important for the prevention of cognitive decline or dementia," according to Dae Hyun Yoon of the Psychiatric Department of the National University in Seoul. Avoiding obesity, in particular around the abdomen, could be a way of countering dementia, the study concluded. The researchers analysed data on weight and waist circumference in 250 subjects older than 60 in South Korea. The study included body mass index (BMI) measurements that relate height to weight, and using computer tomography on the abdominal region. The researchers found a statistical correlation between abdominal obesity (visceral adiposity) and intelligence in the group, without finding a discernible cause-and-effect relationship. Although previous studies had discovered a similar relationship, a larger study was necessary to confirm the results, the team said. Abdominal fat, as opposed to subcutaneous fat, tended to lead to problems with metabolizing sugars and fats, it said. "The study showed that a high BMI was linked to the risk of lower cognitive performance in adults between 60 and 70," the authors wrote. In the case of participants older than 70, no link could be found between either abdominal fat or subcutaneous fat and intellectual performance. This showed that the link between visceral adiposity (abdominal fat) and reduced cognitive performance disappeared with age. Cognitive ability was tested by means of the so-called Mini Mental State Examination, which requires the subjects to answer simple questions that test understanding of time, space, language and motor skills in about 10 minutes.